Not to be confused with fat. Three-dimensional representations of several fatty acids. Saturated fatty acids have perfectly straight chain structure. Unsaturated ones are typically bent, unless they have a trans configuration. In chemistry, particularly in biochemistry, a fatty acid is a carboxylic acid with a long aliphatic chain, which is either saturated or unsaturated. Most naturally occurring fatty acids have an unbranched chain of an even number of carbon atoms, from 4 to 28. Fatty acids are usually not found in organisms, but instead as three main classes of esters: triglycerides, phospholipids, and cholesterol esters. In any of these forms, fatty acids are both important dietary sources of fuel for animals and they are important structural components for cells. The concept of fatty acid (acide gras) was introduced by Michel Eugène Chevreul, though he initially used some variant terms: graisse acide and acide huileux ("acid fat" and "oily acid"). Comparison of the trans isomer Elaidic acid (top) and the cis isomer oleic acid (bottom). Fatty acids differ by length, often categorized as short to very long. Short-chain fatty acids (SCFA) are fatty acids with aliphatic tails of five or fewer carbons (e.g. butyric acid). Medium-chain fatty acids (MCFA) are fatty acids with aliphatic tails of 6 to 12 carbons, which can form medium-chain triglycerides. For a more comprehensive list, see List of saturated fatty acids. Saturated fatty acids have no C=C double bonds. They have the same formula CH3(CH2)nCOOH, with variations in "n". An important saturated fatty acid is stearic acid (n = 16), which when neutralized with lye is the most common form of soap. Unsaturated fatty acids have one or more C=C double bonds. The C=C double bonds can give either cis or trans isomers. A cis configuration means that the two hydrogen atoms adjacent to the double bond stick out on the same side of the chain. The rigidity of the double bond freezes its conformation and, in the case of the cis isomer, causes the chain to bend and restricts the conformational freedom of the fatty acid. The more double bonds the chain has in the cis configuration, the less flexibility it has. When a chain has many cis bonds, it becomes quite curved in its most accessible conformations. For example, oleic acid, with one double bond, has a "kink" in it, whereas linoleic acid, with two double bonds, has a more pronounced bend. α-Linolenic acid, with three double bonds, favors a hooked shape. 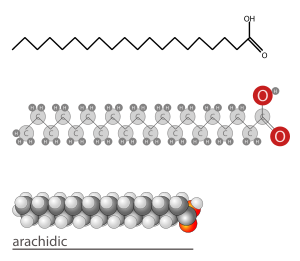 The effect of this is that, in restricted environments, such as when fatty acids are part of a phospholipid in a lipid bilayer, or triglycerides in lipid droplets, cis bonds limit the ability of fatty acids to be closely packed, and therefore can affect the melting temperature of the membrane or of the fat. A trans configuration, by contrast, means that the adjacent two hydrogen atoms lie on opposite sides of the chain. As a result, they do not cause the chain to bend much, and their shape is similar to straight saturated fatty acids. In most naturally occurring unsaturated fatty acids, each double bond has three n carbon atoms after it, for some n, and all are cis bonds. Most fatty acids in the trans configuration (trans fats) are not found in nature and are the result of human processing (e.g., hydrogenation). The differences in geometry between the various types of unsaturated fatty acids, as well as between saturated and unsaturated fatty acids, play an important role in biological processes, and in the construction of biological structures (such as cell membranes). The position of the carbon atoms in a fatty acid can be indicated from the −COOH (or carboxy) end, or from the −CH3 (or methyl) end. If indicated from the −COOH end, then the C-1, C-2, C-3, ….(etc.) notation is used (blue numerals in the diagram on the right, where C-1 is the −COOH carbon). If the position is counted from the other, −CH3, end then the position is indicated by the ω-n notation (numerals in red, where ω-1 refers to the methyl carbon). The positions of the double bonds in a fatty acid chain can, therefore, be indicated in two ways, using the C-n or the ω-n notation. Thus, in an 18 carbon fatty acid, a double bond between C-12 (or ω-7) and C-13 (or ω-6) is reported either as Δ12 if counted from the −COOH end (indicating only the “beginning” of the double bond), or as ω-6 (or omega-6) if counting from the −CH3 end. The “Δ” is the Greek letter delta, which translates into “D” ( for Double bond) in the Roman alphabet. Omega (ω) is the last letter in the Greek alphabet, and is therefore used to indicate the “last” carbon atom in the fatty acid chain. Since the ω-n notation is used almost exclusively to indicate the positions of the double bonds close to the −CH3 end in essential fatty acids, there is no necessity for an equivalent “Δ”-like notation - the use of the “ω-n” notation always refers to the position of a double bond. Fatty acids with an odd number of carbon atoms are called odd-chain fatty acids, whereas the rest are even-chain fatty acids. The difference is relevant to gluconeogenesis. The following table describes the most common systems of naming fatty acids. 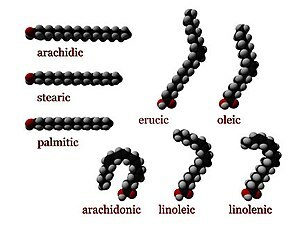 Palmitoleic acid Trivial names (or common names) are non-systematic historical names, which are the most frequent naming system used in literature. Most common fatty acids have trivial names in addition to their systematic names (see below). These names frequently do not follow any pattern, but they are concise and often unambiguous. (9Z)-octadec-9-enoic acid Systematic names (or IUPAC names) derive from the standard IUPAC Rules for the Nomenclature of Organic Chemistry, published in 1979, along with a recommendation published specifically for lipids in 1977. Counting begins from the carboxylic acid end. Double bonds are labelled with cis-/trans- notation or E-/Z- notation, where appropriate. This notation is generally more verbose than common nomenclature, but has the advantage of being more technically clear and descriptive. cis,cis-Δ9,Δ12 octadecadienoic acid In Δx (or delta-x) nomenclature, each double bond is indicated by Δx, where the double bond is located on the xth carbon–carbon bond, counting from the carboxylic acid end. Each double bond is preceded by a cis- or trans- prefix, indicating the configuration of the molecule around the bond. For example, linoleic acid is designated "cis-Δ9, cis-Δ12 octadecadienoic acid". This nomenclature has the advantage of being less verbose than systematic nomenclature, but is no more technically clear or descriptive. n−3 n−x (n minus x; also ω−x or omega-x) nomenclature both provides names for individual compounds and classifies them by their likely biosynthetic properties in animals. A double bond is located on the xth carbon–carbon bond, counting from the terminal methyl carbon (designated as n or ω) toward the carbonyl carbon. For example, α-Linolenic acid is classified as a n−3 or omega-3 fatty acid, and so it is likely to share a biosynthetic pathway with other compounds of this type. The ω−x, omega-x, or "omega" notation is common in popular nutritional literature, but IUPAC has deprecated it in favor of n−x notation in technical documents. The most commonly researched fatty acid biosynthetic pathways are n−3 and n−6. 2 units, i.e., at intervals of 3 carbon atoms along the chain). This notation can be ambiguous, as some different fatty acids can have the same numbers. Consequently, when ambiguity exists this notation is usually paired with either a Δx or n−x term. 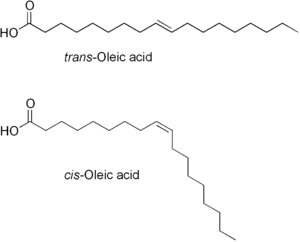 IUPAC nomenclature of lipids recommendations use the first mentioned notation with a list of double bond positions in parentheses appended. When circulating in the plasma (plasma fatty acids) are not in their ester, fatty acids are known as non-esterified fatty acids (NEFAs) or free fatty acids (FFAs). FFAs are always bound to a transport protein, such as albumin. Fatty acids are usually produced industrially by the hydrolysis of triglycerides, with the removal of glycerol (see oleochemicals). Phospholipids represent another source. Some fatty acids are produced synthetically by hydrocarboxylation of alkenes.Template:Says whom? In animals, fatty acids are formed from carbohydrates predominantly in the liver, adipose tissue, and the mammary glands during lactation. Carbohydrates are converted into pyruvate by glycolysis as the first important step in the conversion of carbohydrates into fatty acids. Pyruvate is then decarboxylated to form acetyl-CoA in the mitochondrion. However, this acetyl CoA needs to be transported into cytosol where the synthesis of fatty acids occurs. This cannot occur directly. To obtain cytosolic acetyl-CoA, citrate (produced by the condensation of acetyl-CoA with oxaloacetate) is removed from the citric acid cycle and carried across the inner mitochondrial membrane into the cytosol. There it is cleaved by ATP citrate lyase into acetyl-CoA and oxaloacetate. The oxaloacetate is returned to the mitochondrion as malate. The cytosolic acetyl-CoA is carboxylated by acetyl CoA carboxylase into malonyl-CoA, the first committed step in the synthesis of fatty acids. Malonyl-CoA is then involved in a repeating series of reactions that lengthens the growing fatty acid chain by two carbons at a time. Almost all natural fatty acids, therefore, have even numbers of carbon atoms. When synthesis is complete the free fatty acids are nearly always combined with glycerol (three fatty acids to one glycerol molecule) to form triglycerides, the main storage form of fatty acids, and thus of energy in animals. However, fatty acids are also important components of the phospholipids that form the phospholipid bilayers out of which all the membranes of the cell are constructed (the cell wall, and the membranes that enclose all the organelles within the cells, such as the nucleus, the mitochondria, endoplasmic reticulum, and the Golgi apparatus). The "uncombined fatty acids" or "free fatty acids" found in the circulation of animals come from the breakdown (or lipolysis) of stored triglycerides. Because they are insoluble in water, these fatty acids are transported bound to plasma albumin. The levels of "free fatty acids" in the blood are limited by the availability of albumin binding sites. They can be taken up from the blood by all cells that have mitochondria (with the exception of the cells of the central nervous system). Fatty acids can only be broken down in mitochondria, by means of beta-oxidation followed by further combustion in the citric acid cycle to CO2 and water. Cells in the central nervous system, which, although they possess mitochondria, cannot take free fatty acids up from the blood, as the blood-brain barrier is impervious to most free fatty acids, excluding short-chain fatty acids and medium-chain fatty acids. These cells have to manufacture their own fatty acids from carbohydrates, as described above, in order to produce and maintain the phospholipids of their cell membranes, and those of their organelles. The following table gives the fatty acid, vitamin E and cholesterol composition of some common dietary fats. Fatty acids exhibit reactions like other carboxylic acids, i.e. they undergo esterification and acid-base reactions. Fatty acids do not show a great variation in their acidities, as indicated by their respective pKa. Nonanoic acid, for example, has a pKa of 4.96, being only slightly weaker than acetic acid (4.76). As the chain length increases, the solubility of the fatty acids in water decreases, so that the longer-chain fatty acids have minimal effect on the pH of an aqueous solution. Even those fatty acids that are insoluble in water will dissolve in warm ethanol, and can be titrated with sodium hydroxide solution using phenolphthalein as an indicator. This analysis is used to determine the free fatty acid content of fats; i.e., the proportion of the triglycerides that have been hydrolyzed. Neutralization of fatty acids, i.e. saponification, is a widely practiced route to metallic soaps. Hydrogenation of unsaturated fatty acids is widely practiced. Typical conditions involve 2.0–3.0 MPa of H2 pressure, 150 °C, and nickel supported on silica as a catalyst. This treatment affords saturated fatty acids. The extent of hydrogenation is indicated by the iodine number. Hydrogenated fatty acids are less prone toward rancidification. Since the saturated fatty acids are higher melting than the unsaturated precursors, the process is called hardening. Related technology is used to convert vegetable oils into margarine. The hydrogenation of triglycerides (vs fatty acids) is advantageous because the carboxylic acids degrade the nickel catalysts, affording nickel soaps. During partial hydrogenation, unsaturated fatty acids can be isomerized from cis to trans configuration. More forcing hydrogenation, i.e. using higher pressures of H2 and higher temperatures, converts fatty acids into fatty alcohols. Fatty alcohols are, however, more easily produced from fatty acid esters. In the Varrentrapp reaction certain unsaturated fatty acids are cleaved in molten alkali, a reaction at one time of relevance to structure elucidation. Unsaturated fatty acids undergo a chemical change known as auto-oxidation. The process requires oxygen (air) and is accelerated by the presence of trace metals. Vegetable oils resist this process to a small degree because they contain antioxidants, such as tocopherol. Fats and oils often are treated with chelating agents such as citric acid to remove the metal catalysts. Unsaturated fatty acids are susceptible to degradation by ozone. This reaction is practiced in the production of azelaic acid ((CH2)7(CO2H)2) from oleic acid. Short- and medium-chain fatty acids are absorbed directly into the blood via intestine capillaries and travel through the portal vein just as other absorbed nutrients do. However, long-chain fatty acids are not directly released into the intestinal capillaries. Instead they are absorbed into the fatty walls of the intestine villi and reassembled again into triglycerides. The triglycerides are coated with cholesterol and protein (protein coat) into a compound called a chylomicron. From within the cell, the chylomicron is released into a lymphatic capillary called a lacteal, which merges into larger lymphatic vessels. It is transported via the lymphatic system and the thoracic duct up to a location near the heart (where the arteries and veins are larger). The thoracic duct empties the chylomicrons into the bloodstream via the left subclavian vein. At this point the chylomicrons can transport the triglycerides to tissues where they are stored or metabolized for energy. When metabolized, fatty acids yield large quantities of ATP. Many cell types can use either glucose or fatty acids for this purpose. Fatty acids (provided either by ingestion or by drawing on triglycerides stored in fatty tissues) are distributed to cells to serve as a fuel for muscular contraction and general metabolism. They are broken down to CO2 and water by the intra-cellular mitochondria, releasing large amounts of energy, captured in the form of ATP through beta oxidation and the citric acid cycle. Fatty acids that are required for good health but cannot be made in sufficient quantity from other substrates, and therefore must be obtained from food, are called essential fatty acids. There are two series of essential fatty acids: one has a double bond three carbon atoms away from the methyl end; the other has a double bond six carbon atoms away from the methyl end. Humans lack the ability to introduce double bonds in fatty acids beyond carbons 9 and 10, as counted from the carboxylic acid side. Two essential fatty acids are linoleic acid (LA) and alpha-linolenic acid (ALA). These fatty acids are widely distributed in plant oils. The human body has a limited ability to convert ALA into the longer-chain omega-3 fatty acids — eicosapentaenoic acid (EPA) and docosahexaenoic acid (DHA), which can also be obtained from fish. Omega-3 and omega-6 fatty acids are biosynthetic precursors to endocannabinoids with antinociceptive, anxiolytic, and neurogenic properties. Blood fatty acids are in different forms in different stages in the blood circulation. They are taken in through the intestine in chylomicrons, but also exist in very low density lipoproteins (VLDL) and low density lipoproteins (LDL) after processing in the liver. In addition, when released from adipocytes, fatty acids exist in the blood as free fatty acids. It is proposed that the blend of fatty acids exuded by mammalian skin, together with lactic acid and pyruvic acid, is distinctive and enables animals with a keen sense of smell to differentiate individuals. Fatty acids are mainly used in the production of soap, both for cosmetic purposes and, in the case of metallic soaps, as lubricants. Fatty acids are also converted, via their methyl esters, to fatty alcohols and fatty amines, which are precursors to surfactants, detergents, and lubricants. Other applications include their use as emulsifiers, texturizing agents, wetting agents, anti-foam agents, or stabilizing agents. Esters of fatty acids with simpler alcohols (such as methyl-, ethyl-, n-propyl-, isopropyl- and butyl esters) are used as emollients in cosmetics and other personal care products and as synthetic lubricants. Esters of fatty acids with more complex alcohols, such as sorbitol, ethylene glycol, diethylene glycol, and polyethylene glycol are consumed in food, or used for personal care and water treatment, or used as synthetic lubricants or fluids for metal working. Wikimedia Commons has media related to Fatty acids. ^ Moss, G. P.; Smith, P. A. S.; Tavernier, D. (1997). IUPAC Compendium of Chemical Terminology. Pure and Applied Chemistry. 67 (2nd ed.). International Union of Pure and Applied Chemistry. pp. 1307–1375. doi:10.1351/pac199567081307. ISBN 978-0-521-51150-6. Retrieved 2007-10-31. ^ Chevreul, M. E. (1813). Sur plusieurs corps gras, et particulièrement sur leurs combinaisons avec les alcalis. Annales de Chimie, t. 88, p. 225-261. link (Gallica), link (Google). ^ Menten, P. Dictionnaire de chimie: Une approche étymologique et historique. De Boeck, Bruxelles. link. ^ Cifuentes, Alejandro, ed. (2013-03-18). "Microbial Metabolites in the Human Gut". Foodomics: Advanced Mass Spectrometry in Modern Food Science and Nutrition. John Wiley & Sons, 2013. ISBN 9781118169452. ^ Beermann, C.; Jelinek, J.; Reinecker, T.; Hauenschild, A.; Boehm, G.; Klör, H.-U. (2003). "Short term effects of dietary medium-chain fatty acids and n−3 long-chain polyunsaturated fatty acids on the fat metabolism of healthy volunteers". Lipids in Health and Disease. 2: 10. doi:10.1186/1476-511X-2-10. PMC 317357. PMID 14622442. ^ a b c “C:D“ is the numerical symbol: total amount of (C)arbon atoms of the fatty acid, and the number of (D)ouble (unsaturated) bonds in it; if D > 1 it is assumed that the double bonds are separated by one or more methylene bridge(s). ^ Each double bond in the fatty acid is indicated by Δx, where the double bond is located on the xth carbon–carbon bond, counting from the carboxylic acid end. ^ a b "IUPAC Lipid nomenclature: Appendix A: names of and symbols for higher fatty acids". www.sbcs.qmul.ac.uk. ^ In n minus x (also ω−x or omega-x) nomenclature a double bond of the fatty acid is located on the xth carbon–carbon bond, counting from the terminal methyl carbon (designated as n or ω) toward the carbonyl carbon. ^ a b c Rigaudy, J.; Klesney, S. P. (1979). Nomenclature of Organic Chemistry. Pergamon. ISBN 978-0-08-022369-8. OCLC 5008199. ^ a b c d e f Stryer, Lubert (1995). "Fatty acid metabolism.". Biochemistry (4th ed.). New York: W. H. Freeman and Company. pp. 603–628. ISBN 978-0-7167-2009-6. ^ Voet, Donald; Voet, Judith G.; Pratt, Charlotte W. (2006). Fundamentals of Biochemistry (2nd ed.). John Wiley and Sons. pp. 547, 556. ISBN 978-0-471-21495-3. ^ Zechner, R.; Strauss, J. G.; Haemmerle, G.; Lass, A.; Zimmermann, R. (2005). "Lipolysis: pathway under construction". Curr. Opin. Lipidol. 16 (3): 333–340. doi:10.1097/01.mol.0000169354.20395.1c. ^ Altar, Ted. "More Than You Wanted To Know About Fats/Oils". Sundance Natural Foods. Retrieved 2006-08-31. ^ a b c "USDA National Nutrient Database for Standard Reference". U.S. Department of Agriculture. Archived from the original on 2015-03-03. Retrieved 2010-02-17. ^ Bolsover, Stephen R.; et al. (15 February 2004). Cell Biology: A Short Course. John Wiley & Sons. pp. 42ff. ISBN 978-0-471-46159-3. ^ Ramsden, Christopher E.; Zamora, Daisy; Makriyannis, Alexandros; Wood, JodiAnne T.; Mann, J. Douglas; Faurot, Keturah R.; MacIntosh, Beth A.; Majchrzak-Hong, Sharon F.; Gross, Jacklyn R. (August 2015). "Diet-induced changes in n-3 and n-6 derived endocannabinoids and reductions in headache pain and psychological distress". The Journal of Pain. 16 (8): 707–716. doi:10.1016/j.jpain.2015.04.007. ISSN 1526-5900. PMC 4522350. PMID 25958314. ^ "Electronic Nose Created To Detect Skin Vapors". Science Daily. July 21, 2009. Retrieved 2010-05-18. ^ "Fatty Acids: Building Blocks for Industry" (PDF). aciscience.org. American Cleaning Institute. Retrieved 22 Apr 2018. Scholia has a chemical-class profile for Fatty acid. This page was last edited on 11 April 2019, at 11:31 (UTC).